Today's tinted lenses allow you to enhance your natural eye color ~ making the blue bluer or the green greener ~ or change it altogether. Cosmetic enhancement tints are designed to enhance your natural eye color. 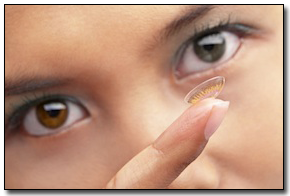 These translucent lenses are best for light-colored eyes (blues and greens, hazels and grays). When wearing these tints, the color of your eye becomes a blend of the lens tint and your natural eye color. Opaque, or "cosmetic", tints change the color of dark eyes. The pattern on the lens, which is colored, overlies the colored part of your eye. The result is a natural.